It's a bank holiday Sunday and we're relaxing on the sofa. Earlier in the morning, we'd cooked some pork and chili sausages, accompanied by onions carmelised in the sausage pan juices and some paprika home fries. Despite this fine meal, a thought crept into my mind. It started out as a gentle nudge and a whisper, but it didn't take long before it was flaunting itself like a can-can dancer and roaring at the top of its voice. "Give me spicy food"! Looking out of our window, I could see leaves scattered everywhere, while tree branches were beginning to look bleak against the grey skies. Against such a backdrop, food which warms both body and soul seemed the best of ideas . Scarves and warm woolen coats on board, we headed out. Thankfully, town was quiet and we were quickly over on the Northside, in the vicinity of Capel Street and Parnell Street. One of my long-term favourite haunts, the Hilan Chinese and Korean, has recently reopened after a refit. (You can read my earlier ill-formed blogging from 2009 here.) The refit has seen the counter swapping sides, while the wooden floors and tables have been replaced with a slate-inspired look. The ugly retro-fitted ventilation systems have now been absorbed into the new ceiling and there's a feeling of more space. The makeover extends to the menu also, which has been expanded with more Chinese options available. 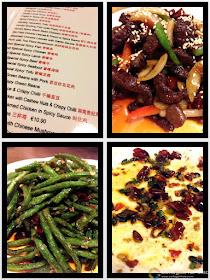 A mountain of fried green beans was crunchy and flavoured with garlic, black fermented beans and a scattering of dried chilis (€9.90). This is a dish I order often in Chinese restaurants and I love to see the variations bought by each chef. (It's often lablled Four Season beans on menus). A spicy fish bowl contained large chunks of soft white fish, floating in a beansprout broth (€12.90). The lightness and delicacy of this dish feels so virtuous but it's tinged with a spicy edge from a topping of chili, garlic, ginger and fresh herbs. 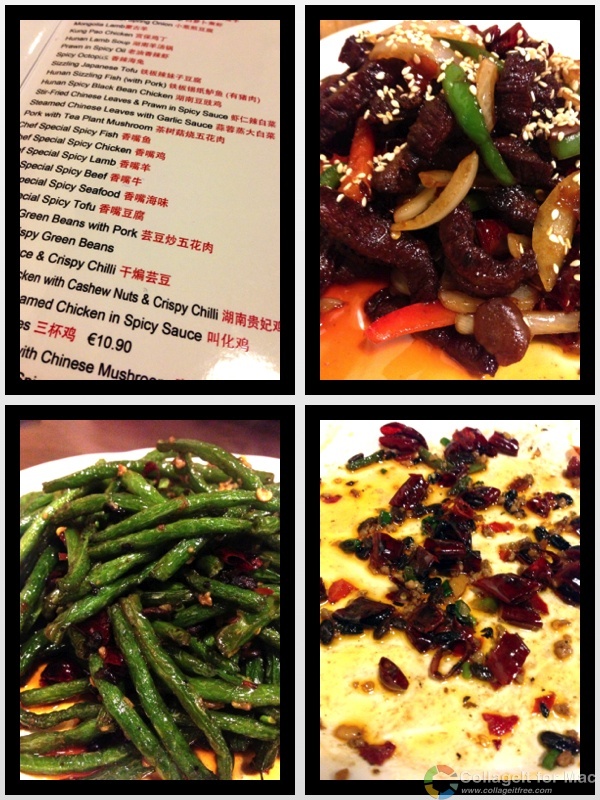 I stepped up the heat level with my choice of dry-fried chili beef (€10.90), which is flavoured with the Sichuan peppercorn. By the way, it's not actually a peppercorn, but is the fruit of the Pricky Ash tree and is a spice that demands respect from the beginning Chinese eater. The initial taste is somewhat medicinal and it quickly progresses to a tingling mouth numbing sensation. It's also utterly delicious and addictive. More please! Soon, we were contentedly facing three decimated plates of food. We were satiated, but that didn't stop us from craning our necks as the waitresses walked past with dishes for other diners. Chinese restaurants invoke dish jealousy and visits always involve a frantic effort to commit dishes to memory for future visits. The Hilan is currently celebrating its 10th birthday, and is offering a 20% discount until the start of December. This meant that the bill for our three large courses and sundries came to a respectable €30.80. Although our meal consisted of Chinese dishes, every table at the Hilan is equipped with a Korean BBQ with a wide range of Korean dishes on offer. Sichuan peppercorns are reputed to act as blood purifiers and digestive aids. I can't verify that but I can tell you that I was warmed and comforted after our meal at the Hilan. As we stepped back out onto the bleak and wintery streets, the charming staff completed the experience with a warm farewell. This looks absolutely delicious! Noted for my next trip to the capital! A food as yummy-looking as this one deserves a good kitchen interior. I don't know, just to match up with the food's presentation, I guess.